ANAHEIM, California – DigiTech today announced the introduction of its Live Harmony, a vocal harmony processor that automatically provides guitarists with a wide range of harmonies and effects. Designed specifically for live performance, Live Harmony uses “intelligent” processing to create full, natural sounding three-part harmonies that perfectly track the chords the performer is playing. Live Harmony is easy to use – simply plug in an electric or acoustic/electric guitar and a microphone, start playing and singing and Live Harmony will take care of the rest. 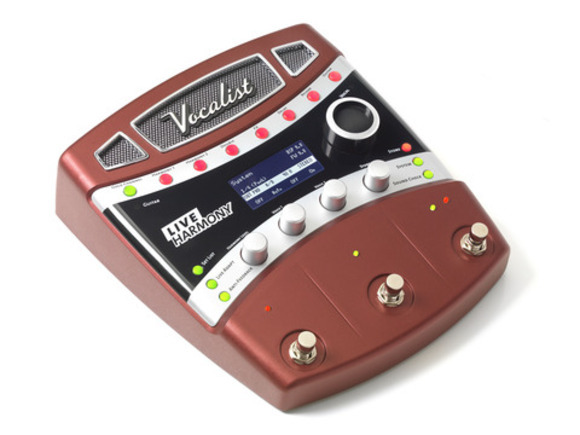 Using HARMAN’s patented musIQ® technology developed by DigiTech, the unit will sense the chords being played and add vocal harmonies in the right key. Performers can even sing a sustained note and when they strum a different chord behind it, Live Harmony will change the accompanying background harmonies. Live Harmony utilizes DigiTech’s Live Adapt processing, which matches harmonies and effects like delay to the song’s tempo, key, scale and Anti Feedback Suppression ensures vocal levels won’t get out of control in tricky venues. A full selection of effects is provided including Lexicon® reverb, dbx® compression, intelligent pitch correction, doubling and 198 presets. The Gold Channel feature allows the performer to engage a pre-set “channel strip” at the touch of a button so they can sound great in an instant. The unit’s Sound Check button will repeat phrases, to let users test the settings of their presets for the acoustics of the room they’re playing in. The Set List function allows a performer to quickly rearrange their presets in any order in the event they want to change the order of the songs in their set.